As luck would have it, this month’s Senri Bunka Centre (Osaka) Eigo de Haiku class fell on the sensei’s birthday, July 23. It had been decided to meet a little early at the secretive jewel that is Nagatani-ike for some LIVE composition. 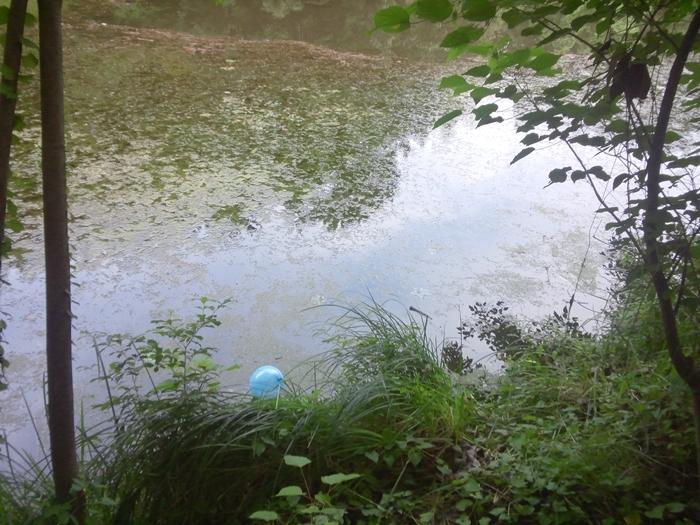 As is the sensei’s wont, he first launched a single birthday balloon, which fell back quietly to the surface of the pond, coming to rest beneath some bankside trees (click on photo: centre left). A handout listing a sample of previous birthday balloon launches (from mountain-tops, cliffs, shores, boats, bridges, or as offerings to rocks or trees) was given to each participant. Today’s was no. 46 in the global series, which, incidentally, did not begin when Tito was 1 year old! 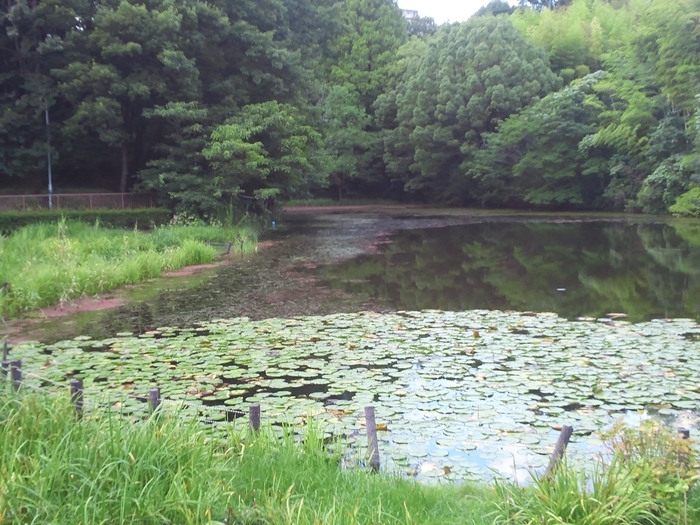 Poets were then requested to wander around the pond and through the bamboo groves and attempt to capture the wayward object and its slightly surreal interaction with something else. As a pointer to the type of poem required, a 1937 haiku by Yamaguchi Seishi was read out (although his one is absolutely real). When we entered the classroom back at the Centre, some redrafting took place … and soon we had a nice selection of slightly surreal haiku to write on the whiteboard. How much more resonant is a slightly surreal haiku than a totally surreal one! The reader is free to imagine his own story. Here are four of about a dozen haiku composed that evening. Which one do you like best? Please leave a comment to tell us!
. “It is the line, as the custodian of the syllable, that controls the shape of a poem. Vowels expand the line; consonants contract it. … The line is the divining rod that releases the wellspring of poetry” (R. Parthasarathy). Perhaps this is also true of lineation in most English haiku?
. I’ve just finished reading R.P.’s magnificent English translation of the 5th Century Tamil epic, the Cilappatikaram. On the first day of this year, out on the Coromandel Coast near the mouth of the Kaveri River at Poombukar, I had stumbled on a tiny local museum commemorating this gem of world literature. Thus was my interest in the epic awakened.